Adventure group explores Kinabatangan River on Expedition Borneo! Home/Borneo Gap Year, Danish Adventure Group, Groups & Schools, News/Adventure group explores Kinabatangan River on Expedition Borneo! Our Expedition Borneo program is popular for its variety of adventure activities, and this month our first adventure group from Denmark visits the Kinabatangan River in Sandakan on their 1-month program! Borneo lures adventurers’ from all over the world with its rich natural biodiversity, and on our Expedition Borneo program the best attractions of Sabah are combined to experience each in a month. Visiting Kinabatangan River for wildlife spotting is one of the more relaxing activities of the program, during which participants will learn about the history and culture of Borneo and its peoples’ traditions and custom too. A river cruise is organized each morning and late afternoon, because it’s ‘prime time’ for wildlife spotting, and it’s also a widely known fact that animals visit riverbanks as part of their daily routine. In the evenings, a walk through the jungle terrain is arranged to find the shyest creatures, such as the tarsier with its iconic plate-sized eyes! Contact our Head Office to experience such an itinerary as our Danish adventurers’ on their Expedition Borneo program! One of our experienced staff can create a program to suit your needs to explore exotic Sabah! 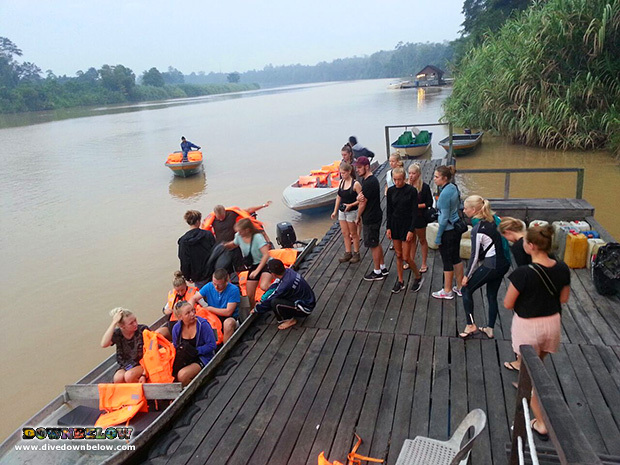 By Joanne Swann|2014-10-08T15:54:13+08:00October 14th, 2014|Borneo Gap Year, Danish Adventure Group, Groups & Schools, News|Comments Off on Adventure group explores Kinabatangan River on Expedition Borneo!